This week sees the release of left-click cooking on ranges, a Slayer helm recolour, mobile tweaks and various bug fixes. We're also running a player survey with prizes of Amazon vouchers and a map of Gielinor. As discussed in the Revenant Cave Rewards: Revisited & Content Changes Poll, all cooking ranges now have a left-click cook option as well as the option to choose to cook any of the first 10 objects that can be cooked in your inventory via a make-x interface. It's not always easy to communicate the amount of work that goes into changes like this which can vary dramatically based on what has to be done. You can check out Mod Kieren's explanation of what was necessary to bring this change and some insight into how it works at the bottom of this news post. Most of you will be familiar with the iconic Slayer helmet worn by players on task since 2014. If you haven't already, consider taking on the Nightmare Zone and gain enough points to upgrade yours to the imbued (i) version allowing it's bonuses to apply to your ranged and magic attacks too. The colour of the Slayer helm has been tweaked so the standard and imbued versions are visually distinct. Work continues on making the mobile experience as user friendly and intuitive as we possibly can. As such, the following changes have been made. 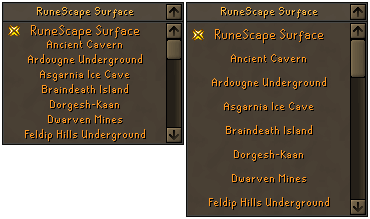 The spaces between options in drop down menus have been increased to make them easier to select. You can see how this looks for the World Map drop down menu below as an example. Overlays are now less likely to overlap with the chatbox, minimap and other parts of the interface which are always visible. Many central interfaces such as the skill guides have had a semi transparent background until now. These have been made fully transparent. Additionally, the attack options menu now displays upwards rather than downwards. 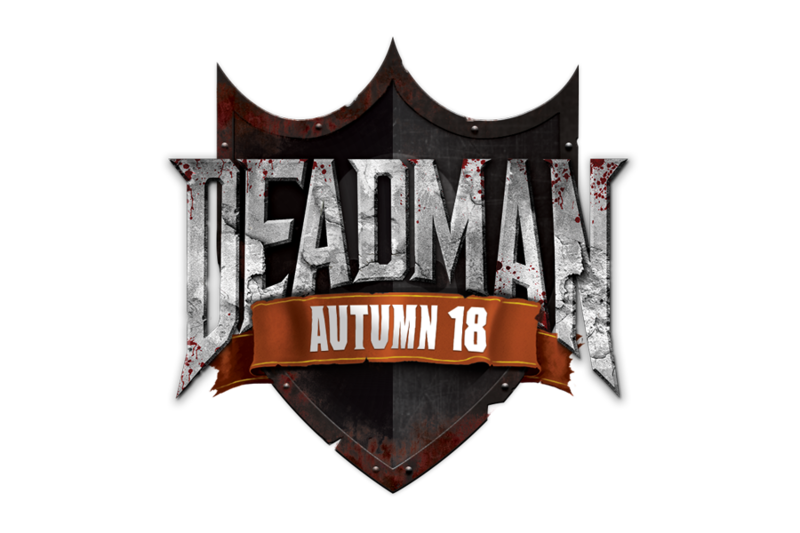 The Deadman Autumn finals have been underway for five days and we're nearing it's conclusion. The finalists are currently battling it out and enjoying the incredibly strong PvP Weapons which will make for an exciting finale and could make the difference in players winning their share of the $32,000 prize money! Make sure to catch all the action on Twitch when the Permadeath stage kicks off on the 15th of September - you can set a reminder for the event! If you haven't competed this time around, remember that the Winter Season begins with the end of the Permadeath stage. You can prepare by checking out the details of the Winter Season. After receiving reports of some doors being able to be abused, spam-clicking of doors in the Barrows has been inhibited. Should there be more issues of places this occuring please submit bug reports ingame via the report button. At Jagex, we are always looking to our players to help us guide the future of Old School RuneScape. To aid in this, we are running a survey to ask players what Old School means to you, and what other games and activities you spend their your time on. Those who complete the survey will be entered into a prize draw to win one of fifty $50 Amazon vouchers (or your stated country's equivalent currency). On top of this, five lucky participants will also receive a huge 60x40 cm (23 ½”x15 ¾”) print map of Gielinor! So, if you want to guide the future of Old School RuneScape and win prizes, be on the lookout for an email to the survey coming out this Friday, September 14th. The email you receive will address you by your display name and will contain a unique link to the survey. We’ll be sending you a reminder email on Friday 21st September if you haven’t completed the survey by then. For those of you that don’t receive an email but still want your chance at providing feedback fear not as we’ll be providing a link to the survey in another newspost in the coming weeks. This is one of those updates that from the outside looks as though it’ll be entirely straight forward… but is far from it! It even convinced me, I took the job expecting it to take me inside a day, but it turned into much more than that (it took me about 5 days of solid work or so in the end). Why Mod Kieren? Why does it take so long to add left click cooking? Well, I’m going to try to explain the infrastructure we used to have and the infrastructure we have now. Before this update, the only way to cook was to use your raw item on the range/fire. This is super useful for us, as it provides us information directly – we know straight away exactly which item you’d like to cook. Mostly that means we just need to ask you how many you want to make and proceed into the core cooking process. We then pass data into the cooking system relevant to the item you’re trying to cook. In the process mentioned there, ~cooking_getquantity asks you how many you’d like to make, and assuming you want to make at least 1, we pass data into the system – these are all the things we need to know, such as what item it turns into when you succeed, when you fail, what messages to give, how much experience to give, what are the chances of success etc. Now the problem is… when left clicking on the range, I don’t know which item you’re trying to cook. You could have 25 steel bars, a raw trout, a raw salmon and a raw lobster in your inventory. I need a way to know that firstly, the steel bars aren’t cookable, and put together a choice screen for you to choose from the items that are. That code above isn’t very helpful for that, it’s all written out long hand inside the trigger for using an item on a range. To make matters worse, it’s written out in three different places! 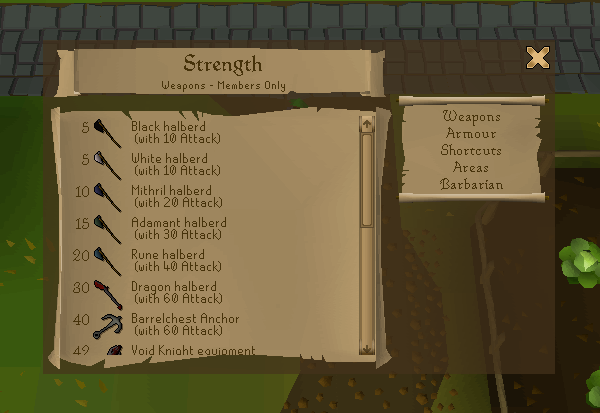 The trigger for using items on the Lumbridge Range, fires and then other ranges. They each offer slightly different chances of success, fires use different animations, and certain items can only be cooked on fires or ranges! Whilst the Lumbridge Range is known for supplying slightly decreased burn rates, it only applies to a small subset of all cookable items, and the Cooking Gauntlets are similar too, adding further complications. The ideal situation, would be a centralised piece of code which is used for fires and all ranges alike – giving the appropriate restrictions and chances as above. There are still two types of interaction though following this update…left click ‘Cooking’ and using a raw item on the cooking device. In one situation, I know what raw item you want to cook, and in the other I need to compile a list of items you could cook from the items in your inventory. Writing data in two places leads to mistakes and extra work for adding future cookable items. This led to the tedious task of converting it all to use a data structure system. There’s a struct for the ‘raw items’, this contains information about the raw object, what it can turn into, level requirements to cook it, restrictions on cooking it on fires or ranges, text for certain messaging etc. There’s then a struct for the ‘cooked items’, this contains information about cooking that particular item, what are the chances of cooking it (on ranges, on fires, on the lumbridge range, and on cooking gauntlets potentially!). This should store all of the information we need to know about cooking that raw into that product – it is a combination of those long hand written out sets of data you saw above from cooking on fires, lumbridge ranges and all other ranges. Now I can much more readily read this data in multiple places! When you use an item, I can verify it’s a cookable item by checking if it has one of these structs associated with it. When you use the new left click cook option, I can check your whole inventory for items that fit the bill too! Now the make-x system does only allow 10 options, so I have to limit it to the first 10 potential products I find in your inventory – but hey, I think that’s going to cover anyone’s culinary desires. A rendering issue with Ankou gloves was fixed. A missing flag in the Varrock museum was added. A chair from inside a wall in the Hosidius household was removed. A clipping issue with Chronicle books on females was improved. A door that was the wrong way around within the Stronghold of Security has been fixed. Players will no longer be able to tick-eat the Enchanted symbol from Mage Arena 2. The Dragonfire shield & ward special attack cool-down can no longer be skipped by re-logging. Work has been done to reduce the cancelling of animations during PvP combat, making it less likely to occur. Players may now drop light sources within caves lit with the "Fire of Eternal Light". Some inconsistencies with scrollable interfaces have been adjusted to make better use of the mouse wheel. Progress in A Tail of Two Cats should no longer abruptly delete Temple Trek followers. Players may now also climb over the rubble beside the Bone Guardian in Enakhra's Lament, providing the guardian has been slain. A broken chatbox in the dialogue of the High Priest of Sophanem, during Icthlarin’s Little Helper, has been removed. Ammonite Crabs in the Fossil Island Task only Wyvern Cave can now be attacked with magic spells as previously you could only melee or range them unless you had a wyvern task.